The La Point family, when my dad was young, lived above a converted cheese factory, then used as a Grange Hall in the Town of Rushford located about five miles west of Omro. Dad was five or six at the time. The residence was located about two miles from Grandpa Flanagans', perhaps the same distance from Grandpa Tritts', and about a mile from his Uncle Art and Aunt Mabel Carpenter. A few years later my grandpa got a job in Manitowoc working for the city's transit system as a conductor. While working there he suffered a serious injury which included a broken leg. Grandma, after "shipping out" her five children to relatives - Virginia would not be born until 1920 - stayed with her husband in a Manitowoc hospital until he recovered. My dad was sent to live with grandparents Charles and Ruth Jane La Point in Little Wolf for about a year. This "farming out" was an accepted practice during those days of rural living. Dad was ten years old when this happened, and he spent that year living in Little Wolf and attending school in Manawa, a city a few miles to the north. The family soon moved to Omro where Dad continued his formal schooling. Sometime later, his dad got a job at Morgans, a sash and door factory, and the family moved to Oshkosh. During the next four to five years the family moved eight times. Dad attended the old Washington school on Waugoo and finished his eighth grade education at a school in Nordheim. Nordheim was an area on the outskirts of Oshkosh located between North Main on the west and Harrison on the east with its southern boundary a little north of Murdock. It was a poor area inhabited with small rundown houses on undesirable land, and, had a reputation, when I was growing up, as a rough neighborhood. After graduation Dad got his first full-time job in Omro working at a stone quarry and gravel pit for four dollars per day. During this time he stayed with his Flanagan grandparents. He worked at this job for about a year, then moved back to Oshkosh with his parents and got a job at R.C. McMillian Sash and Door Company for 27 1/2 cents per hour. As part and parcel of this job he was required to attend school one day per week to learn the machinist trade. He was sixteen. One of his warmest memories when he reminisced of these years was in an anecdote he told more often than any other. It was about building a radio from scratch. But then again, maybe it was about a warm moment spent with his father, and about a family brought together through the efforts of this oldest son. For this troubled man that I never really got to know I gather it was one of his few precious youthful memories of family togetherness. He would buy a few parts each payday, as he recounted this tale of his past, and assemble it on that piece-meal basis. When the radio was eventually completed, he and his dad stayed up most of the night listening to the one or two stations they could get with ear phones blocking out all but the sounds being emitted from the newly assembled set. The excitement it must have generated in my dad and in his brothers and sisters and in his dad as each was clamoring for the use of the headset to hear what was then considered the marvel of the age. Dad in fact said his mother would often get upset because of all the noise created by the kids fighting over whose turn was next. But you could tell by looking at his face - it was especially written in his eyes that even the disturbed effect it had on his mother was recalled with pleasure and a sense of accomplishing a feeling of family. Little do I know of my mother's growing-up years. She was not one to talk at length about her childhood. So her life on the farm, at school, and then as a young woman at work is largely unknown to me. My guess is that her childhood was fairly typical of other farm children of her day. She was born on July 13, 1907, the second of five children. She and her two sisters and two brothers attended a one-room schoolhouse in the Town of Fairburn no more than one-half mile from the family farm, and a block or two from their church, St. Paul's Evangelical Lutheran. The church is still standing, the schoolhouse is not. She completed grades one through eight in the same school and with possibly the same teacher. It was the custom of the day after completing the eighth grade to help on the farm if needed or board with a family in the city while working in a factory or in a home as an all-purpose maid. My mother, being no exception, worked in a Berlin glove factory at the age of fourteen or fifteen while boarding with a family during the week and coming home weekends. Some time later - perhaps a year or two went by - my mother moved to Oshkosh, boarded and did housework for an Oshkosh family. Her older sister Hertha had arrived in this city a few years before had encouraged the move. Later on she was hired at Mondl Shoe factory where wages and hours were somewhat better. When she was twenty or twenty-one, still working at Mondls', she met Russ La Point. They met at a house party when he was twenty. House parties were in in the 1920s. This was the age of prohibition. Saloons and taverns, the legal ones anyway, were the thing of the past. Home brew, hooch, bathtub gin were the touchstones of the era. And when the host rolled up the living room rug most everyone, who cared to, danced to the sounds of the Victrola or whoever might be playing. During one such party Russell Carleton La Point asked Ella Amanda Abel for a date. He took her to see a motion picture; a movie called Ramona. This was 1928, talking pictures were just starting. Whether the theme song Ramona was heard from this new film technology or played by an organ player as the picture was rolling is now anyone's guess. And when their six sons sang this song at their 40th Wedding Anniversary reminiscences of that night could clearly be seen on their faces. 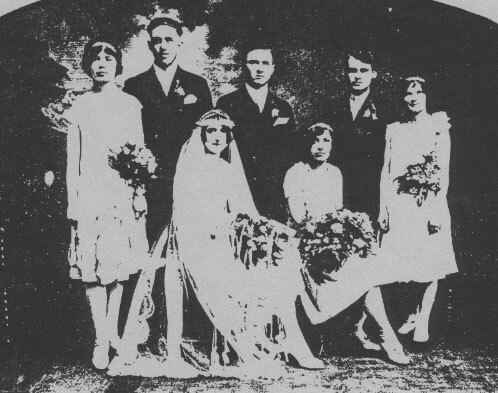 On April 17, 1929 Russ and Ella were married. The ceremony took place at St. Paul's Evangelical Lutheran Church in the Town of Fairburn. A reception followed and the next day there was a chivaree. Although now out of date, the chivaree was a practiced tradition of my parent's time. It was a custom where friends of the bride and groom would present a noisy mock serenade to the newlyweds. The "serenade" consisted of shotguns, tin pans, dinner bells, saws, and whatever else made noise. The wedding party filled milk pails with home brew, and gave sandwiches and cigars to the assembled group and they quickly went off to have their own party. 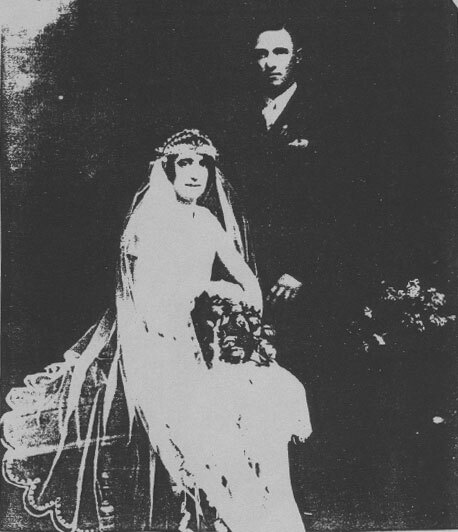 They began their married life at 22 Monroe Street in Oshkosh. Dad was employed at Carver Ice Cream as a milkman. He worked from two until ten in the morning seven days a week delivering milk and other dairy products to homes. His pay was thirty-two dollars. He was layed off not too far into the marriage. Oshkosh was already feeling the effects of the Stock Market Crash. He soon found other types of work but the pay was little and it was usually part-time. It didn't take him long to discover that for a man of his background and training little else was available. They survived by moving into Aunt Hertha's and Uncle Ed's house for some months and then with my dad's parents on Ninth Street. The election of Franklin Delano Roosevelt in November of 1932 would soon spell some relief for men like my dad. Roosevelt's promise of attacking the depressed economy head-on by employing the jobless in useful work soon took shape in programs like the CCC, WPA and PWA. When federal monies were allocated for public works, my father, along with many others, anxiously awaited for information on jobs and eligibility. Qualifications for government employment programs were soon published in the paper. A family was required to establish eligibility at Relief Centers set up in each city. This my father did. While doing so he was told to fill out a grocery order and a wood and coal order that would be filled, according to the Center, as quickly as possible. It is my feeling that on that day my father became a lifelong Democrat. A couple of weeks later he got orders to report to work at a WPA project digging ditches for new sewers being installed in Oshkosh. His pay, he was told, would be twelve dollars per week. It is clear that this program and others like it saved thousands of families from the degradation of poverty and the sense of hopelessness economic depressions, especially one of this magnitude, bring to those caught on its underside. And despite the arrogance of the self-righteous - and there were many - who considered themselves above what they described as government handouts, the New Deal programs provided a measure of self-respect to the working man of the family. It most certainly had this effect on my dad. After only a few weeks of digging ditches, George Oaks, a friend, who would soon become mayor, got my dad a job as timekeeper. In a few months he became senior timekeeper. That promotion doubled his pay. Is it any wonder that two of his favorite homilies were: "If it wouldn't of been for that man in the White House ...," and "George Oaks was a friend of the working man." My Mother and Dad on their wedding day, April 17, 1929. My parent's wedding party. From left: Rose Miller (Kutchera), Herb Abel, Frieda Abel, Louie Ader, Vera La Point. Vera and Louie would soon get married. 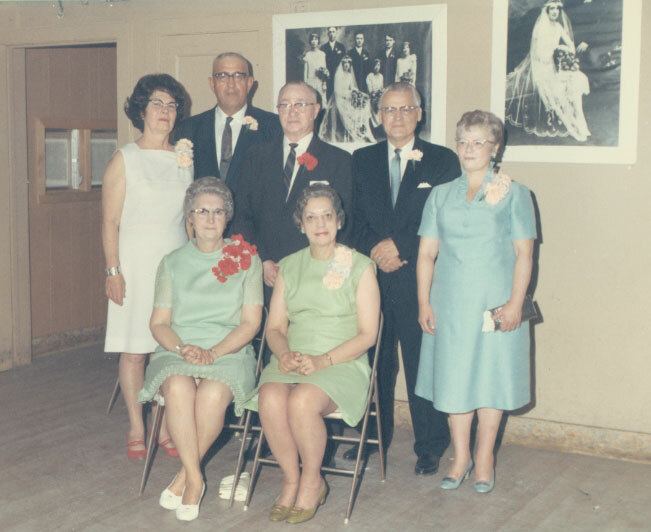 The same wedding party posed for this photo in 1969 for Russ and Ella's 40th wedding anniversary. Standing (from left): Rose Miller (Kutchera), Herb Abel, Russell La Point, Louie Ader, Vera Ader. Seated: Ella La Point, Frieda Etrick.